To produce these tiny sculptures, Harimogura uses a cast resin and realistically paints them using lacquer pigment. Harimogura say the items are made with “time, love, and affection”, which isn’t hard to see! 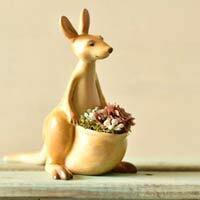 Let these sweet little animals carry your plants on their backs.